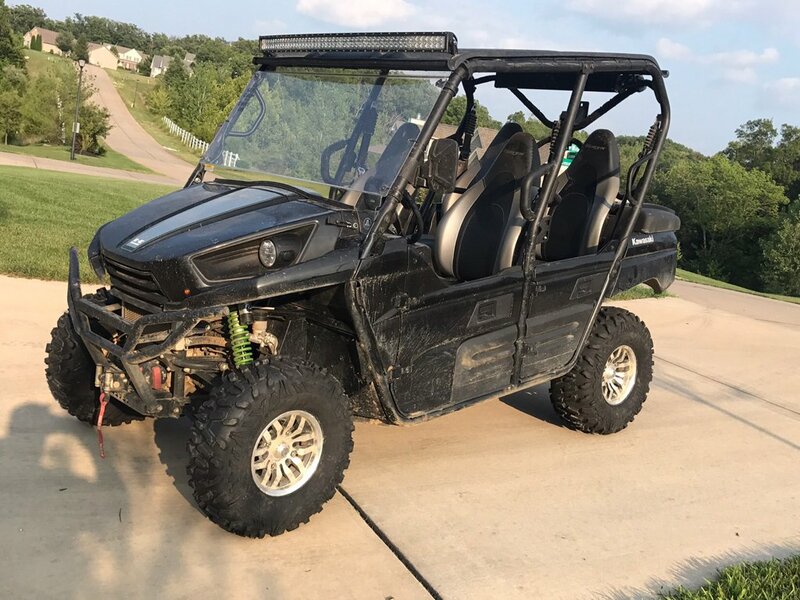 I have a 2015 Teryx4 with the stock 12" aluminum wheels. The bighorn 2.0's are about done. I would like to go with a little bigger tire and need some recommendations. I don't want to put a lift on it, I want to keep it stock to keep it as reliable as possible. 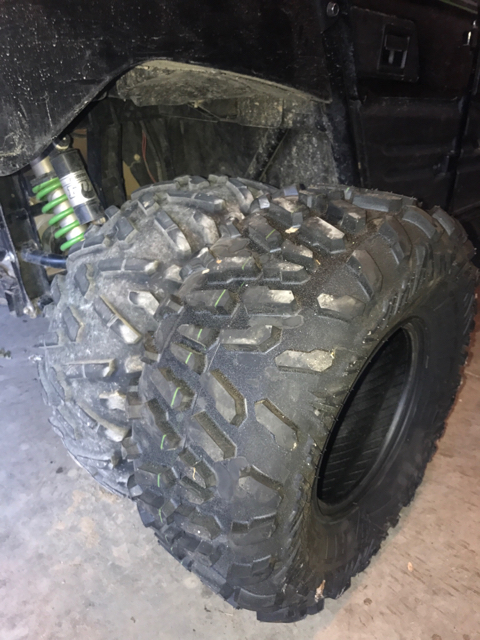 How large of tire can I put on the stock set up and have it not rub? We ride on trails with a mix of mud holes, rocky hills, and creeks. Thank you in advance for any help. Live for the moment and ride as if there is no tomorrow! welcome to the Forum !!!!!!!!! ditch the 12's & get some 14's !!!!!! jeffm, 8zero8, Jones_Mahoney and 1 others like this. I'll be curious to read how those 28" work out for ya. I was wondering the same as you for my next set of tires. I want to keep the suspension all stock but run the tallest tire I can without rubbing. Please post about your results after you get the new treads. Already spent enough on the wet sounds/jl sub/ and light bars front and back Don't really want to buy rims when the ones on it look fine. Also looking at the tusk terrabite 27's but wonder how well they would do in the mud holes we encounter. Which programmer Dyno jet or vforcejohn? Those are good looking tires. Did you go with the 11s for the rear and the 9s for the front? That is exactly the tire set up I put om my machine. I have a 2" lift and 1 1/2" wheel spacers so it isn't apples to apples but I like the tires so far. The odd thing is the way the tire stands up as compared to the big horns. The side wall is much stiffer so with the same air pressure they don't look squatted. I used 3 different pressure gauges to check the psi cause I had too much pressure. Deer season is coming so I will see what they do. I went with 27x9x12’s all the way around (running front wheels on the rear ). I did the 2” Highlifter , on the front only, because I was tired of hitting every rock or limb that was in the trail. Tires showed up today. They look pretty good. Sidewalls seem stiffer than the bighorn 2's. Similar tread pattern but more of the treads than the bh2's. 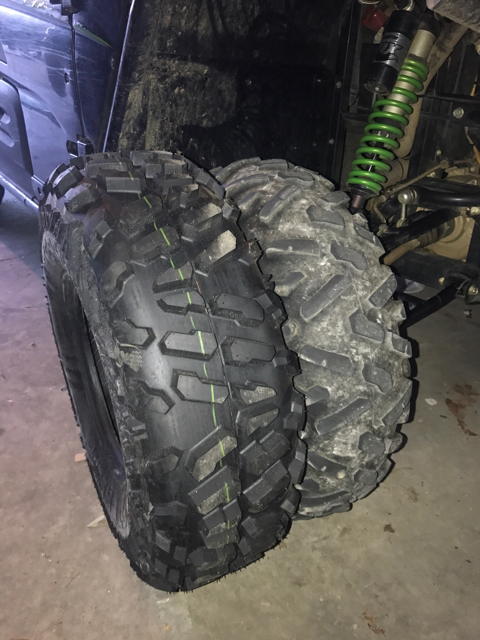 Here are a couple pics of the front and rear tires sitting next to the stock tires. I think I am going to wait just a bit to mount them so I can scrub the old ones running around town for a while. I'll mount them up as soon as I go on a weekend with it. You will be surprised how much stiffer they are. I expect them to perform better than the bighorns at least for my style of riding (slow hunting trails). I think the rubber compound is harder then the BH tires too. I will try to get out and get a pick of my tires on the teryx tomorrow. Yeah. These things are stiffer without air than the bh2's are with air. Thanks for the pics! Those 28" look so much larger diameter than the stock tires. I'm looking forward to your report regarding clearance on your stock 'buggy'. So I got out some yesterday to set a few trail cameras on the deer lease yesterday and man these tires pulled. I did notice the added weight of the tires verses the stock big horns but overall I am pleased. The added height gave me the clearance to crawl through a downed tree that I would have had to cut and clear before getting to the area I wanted to go to. I forgot to bring my saw! My hunting buddy said man I like the big tires. Lol Time will tell on how they wear but for the money I'm happy. I may look into a clutch kit next. Did ya get the new tires on yet? Okay, thanks for the status report. Anxious to learn how those tires work for ya with stock suspension & wheels. Curious if you got a chance to check out your new tires? Considering these myself.... so a bit selfish here ! Last edited by Jones_Mahoney; 08-22-2018 at 06:29 AM.